This circuit is designed in response to a request made by Mr Vignesh. What he requested was a circuit for recording and playing voice. I think this circuit is enough for the purpose. 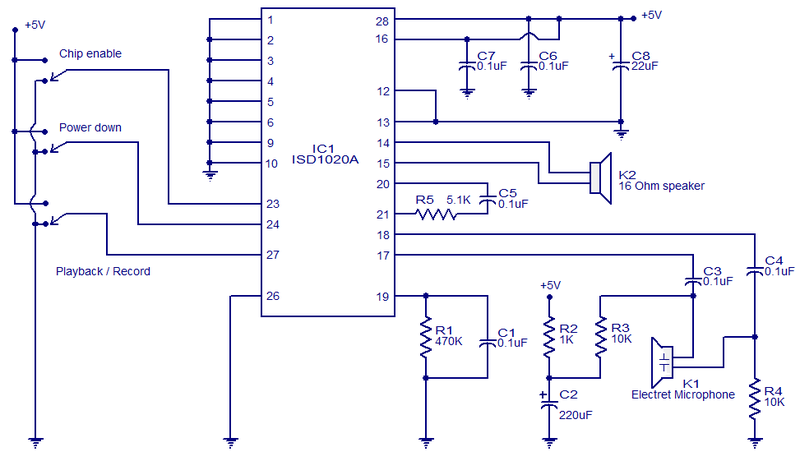 This circuit is based on the IC ISD1020A from ISD. The ISD1020A is a CMOS single chip record/playback device. The chip can record voice for 20seconds and has many features like automatic gain control, anti aliasing filter, built in audio amplifier and smoothing filter. The IC is fully compatible to microprocessors and can be used for a myriad of applications. The voice is stored in their natural form in the non-volatile memory cells inside the IC which enables a high quality reproduction. The recorder voice can be retained in the chip for as long as 100 years and the chip is capable to have a 100000 read/write cycles. The circuit is designed as per the application diagram in the datasheet.Pin23(CE) is the chip enable pin and it has to be held low using switch S1 in order to perform a record or playback cycle. Pin 27 (P/R) is the playback/record pin and a high level on it selects a playback cycle while a low level on it selects a record cycle. The selection can be done using the switch S3.The pin 24 (PD) is the power down pin. It has to be held high using switch S2 in order to pull the device to a extremely low power mode while there is no recording or playback (idle state).The resistor R1 and capacitor C1 determines the release time of the internal AGC circuit. The resistor R5 and capacitor C5 connected across the pin 20 and pin 21 provides an additional cut-off to the low frequency end of the voice pass band. The circuit can be powered from a 5V DC source. Switches S1 to S3 must be miniature SPDT switches. Speaker K2 can be a 16 Î© loud speaker. K1 can be an electret microphone. Please help me in designing a circuit which can play back a message to a duration of around 20 seconds from a chip (which can be changed) till when the user wants to stop from outside. This is intended for a new security system and requires somebody who can manufacture in bulk. I want an amplifier circuit to enhance the output to a higher level. I like the project, I wish to know if there exist a way that I can program a “PICAXE” or any IC so as it can record/playback voice for at least 20sec? if. after recording, i only want to playback the stored voice permanently,then,? Can this circuit be reconfigured to fit into a 3/4 by 1 3/4 cylinder? with mic and controls at one end and speaker on the other end? with a small lithium flat battery? I am designing a new product and need a supplier for the electronic part of the product. Can someone help me find one? The product is a small box, size probably around 10CMX10CM. Inside, the electronic part needs to be a voice recorder that repeats itselfs every 20 seconds until the repeat is cancelled by the user. 4) the user cancels the repeat when he wants. Can someone help me find a supplier? for the electronic part? for the box? hello, thanks for these but i need a circuit diagram for a voice recorder with routing links for multiple connections to a single PC. Need a circuit / Chip which can get date & time as input then record a sound or music. Also it should play the recorded sound or music on the scheduled date and time. Need it urgently… Please help.